In the mid-Atlantic Coastal plain of Virginia and North Carolina, mysterious, dark backwater rivers flow into estuarine sounds contained by the Outer Banks. Here, eleven national wildlife refuges and a national fish hatchery are working to conserve fish, wildlife, plants and their native habitats. 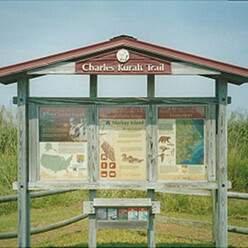 The Charles Kuralt Trail has been established to help people enjoy these wildlands and to recognize the broadcast journalist who shared the delights and wonders of out-of-the-way places like these.